Tulane Sports Medicine serves athletes and communities by working to keep athletes at all levels safe, healthy, and informed. Our team of physicians, athletic trainers, physical therapists and other professionals work together to get athletes back in the game as safely and quickly as possible. We take pride in a multi-disciplinary treatment team who support the athlete’s health and safety, both on and off the field. We’re the official sports medicine provider for all Tulane and Loyola University New Orleans student-athletes and more than 25 area high schools. But it’s not enough to simply to treat injured athletes. Which is why we conduct research related to sports injuries and offer education, support, and training for coaches and parents of athletes at all levels. For example, TISM team members contributed to the passage of Louisiana’s laws regarding youth athletes and concussion. The Louisiana Youth Concussion Act requires all athletes, coaches and others who work with youth athletes to be informed about the concussion risks and symptoms, as well as the dangers of continuing to play with a concussion. Since 2011, the Professional Athlete Care Team (PACT) has been caring for retired professional athletes through partnerships with the National Football League and National Football League Players Association. PACT is a distinctive care model designed to meet the specific needs of former professional athletes. Privacy and transparency are hallmarks of the program, allowing professional athletes the freedom to discuss their health in an open, trusting environment. 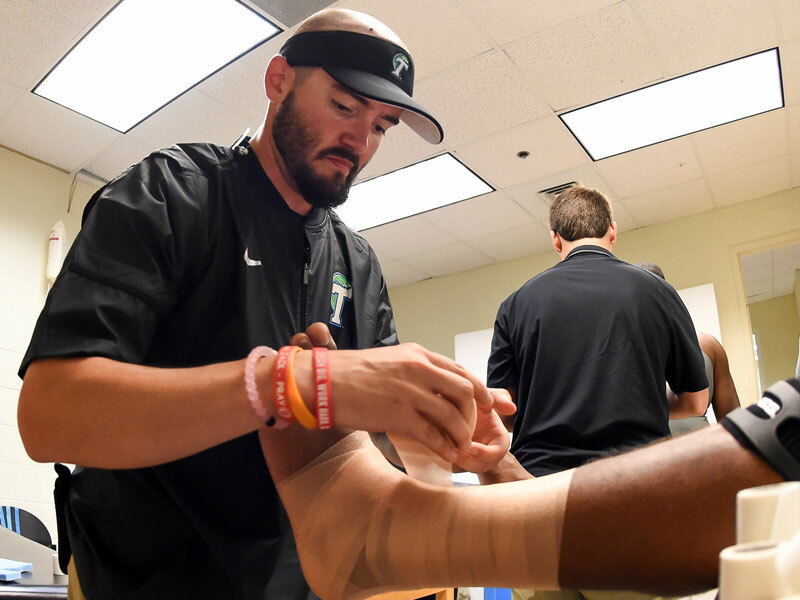 The PACT program is unique in that it uses athletic trainers as navigators to provide former athletes with a higher level of comfort and familiarity. The Tulane Institute of Sports Medicine (TISM) provides elite individualized health care to athletes at all levels of play. In partnership with the Tulane University Medical Group and the Tulane University Medical School, our team is committed to providing the highest quality clinical service, technology, research and education in the field of sports medicine. TISM offers clinical exam rooms, x-ray, MRI, a Human Performance Laboratory, Physical Therapy, Occupational Therapy, Speech Therapy, and Neuropsychology services, all provided on-site. Our affiliation with the Tulane University School of Medicine - one of the nation’s most recognized centers for medical education - allows us access to three hundred fifty physician specialists training the next generation of doctors, available to devote time and expertise to developing state-of-the-art programs for current and former athletes. Free annual high school sports physicals. Women’s Sports Medicine Program: Female athletes face different risks and challenges compared to their male counterparts. For example, female athletes are at an increased risk for ACL tears, anterior knee pain, ankle sprains and stress fractures. The Women’s Sports Medicine Program understands these differences and is designed to provide female athletes of all ages gender-specific treatment and care for sports-related injuries. Tulane Dance Medicine Center: Dancing places unique demands and stresses on the musculoskeletal system. Our team is dedicated to helping professional, student and amateur dancers prevent injuries and stay in top form. Beyond treatment, our team is involved in research to improve prevention of movement-related injuries. Human Performance Lab: The Human Performance Lab enhances the care we provide by enabling our team to perform biomechanical motion analysis of an athlete’s movements to improve performance and reduce the chance of injury.